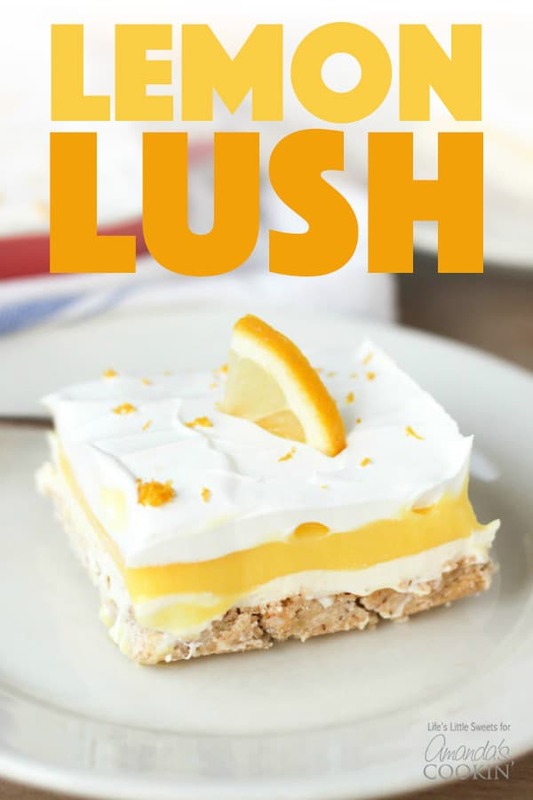 Lemon Lush: the perfect one-pan dessert for potlucks or gatherings! 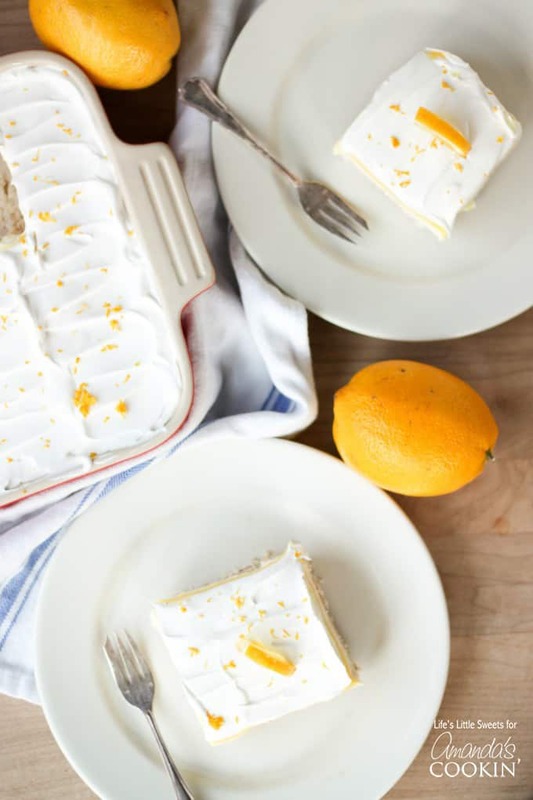 This Lemon Lush is the perfect one-pan dessert for your spring gatherings and summer picnics. A gorgeous “cousin” to our very popular chocolate lasagna, it’s so light and refreshing! 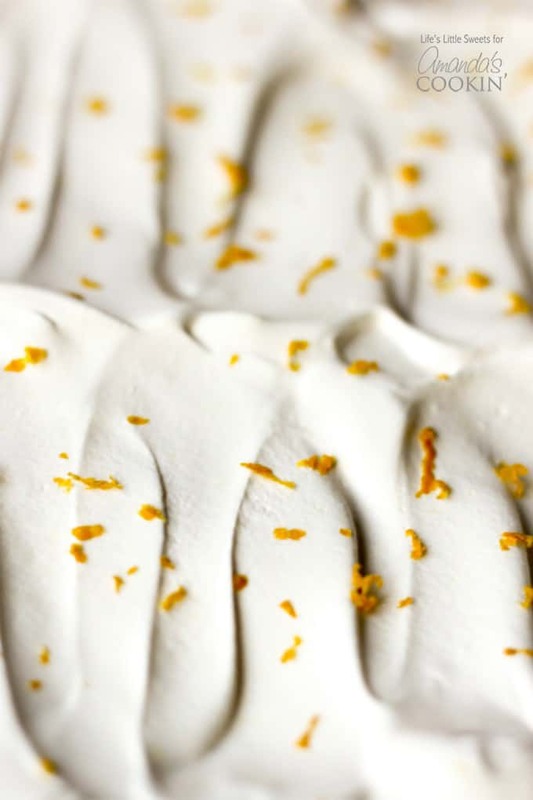 Lemon lush boasts 4 layers – a wonderful pecan crust, pillowy lemon cream cheese and creamy lemon pudding, all topped with lemon zest garnished whipped cream. Hello, Everyone! I don’t know about you but I am dreaming of warm days, blooming flowers and sun rays of spring and summer. And nothing screams summer like lemons! 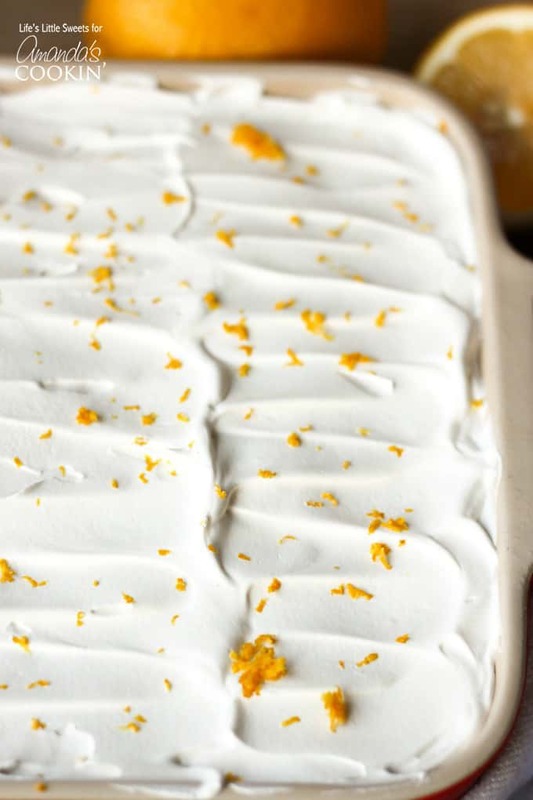 While we’ve enjoyed this beautiful lemon blueberry trifle many times over summer, this lemon lush is great for a slightly smaller crowd and still bursting with summer flavor. 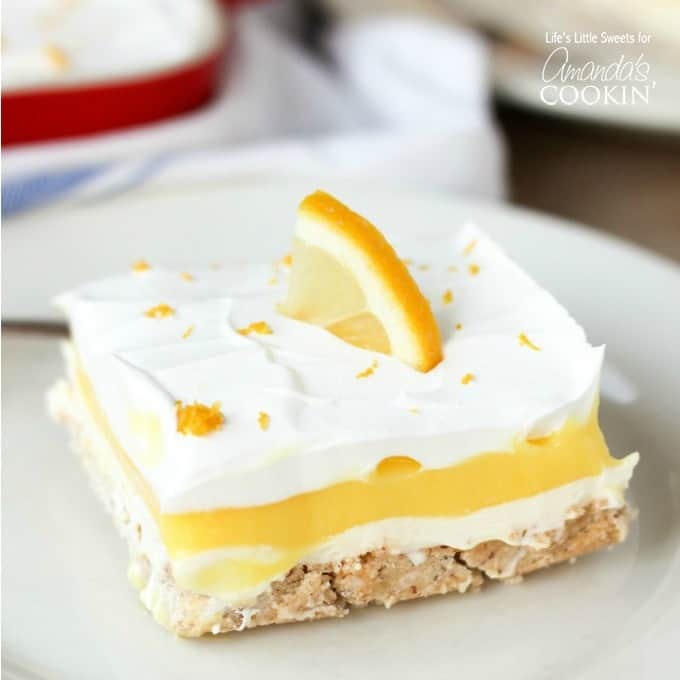 This recipe has a layer of lemon cream cheese and lemon pudding, which is similar to our lemon cheesecake pudding dessert. And who doesn’t like pudding? Pudding is comfort food for me. It’s not too sweet, so you can have a little more and really enjoy it. What’s even better? 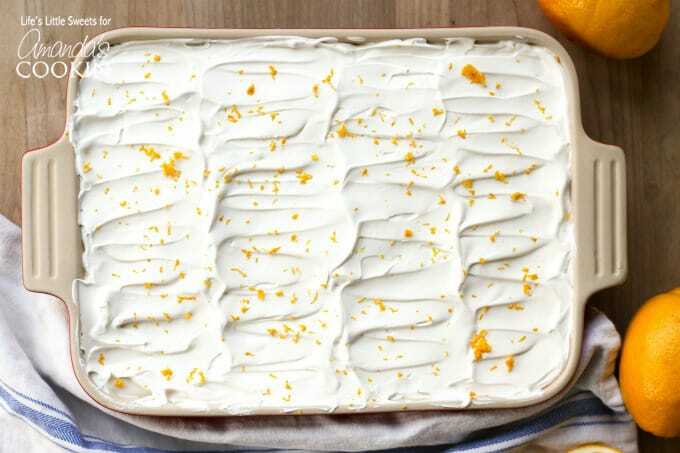 It’s a one-pan dessert which is perfect for potlucks, parties, barbecues and holidays! 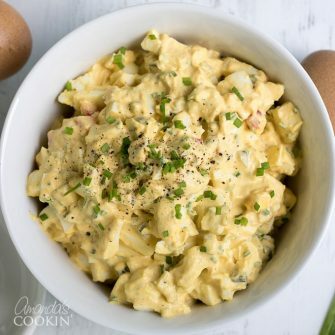 For garnishing the top, you can also sprinkle some finely chopped pecans along with the lemon zest if you choose. You can also get all fancy if you want and pipe the whipped topping using a pastry bag and perhaps a star tip. You can freeze the Lemon Lush overnight (at least 6 hours) to get more defined slices. Make sure you use a sharp knife to cut down into the bottom crust first before removing with the spatula. It will defrost fairly quickly. I suggest getting an organic lemon if you can since you will be using the zest to top the Lemon Lush. After refrigerating, for serving to show more defined layers, you can just take a butter knife and “wipe” along the sides and the layers will show nicely. I know you will enjoy this Lemon Lush dessert, it’s so light and delicious you will want more than one slice! 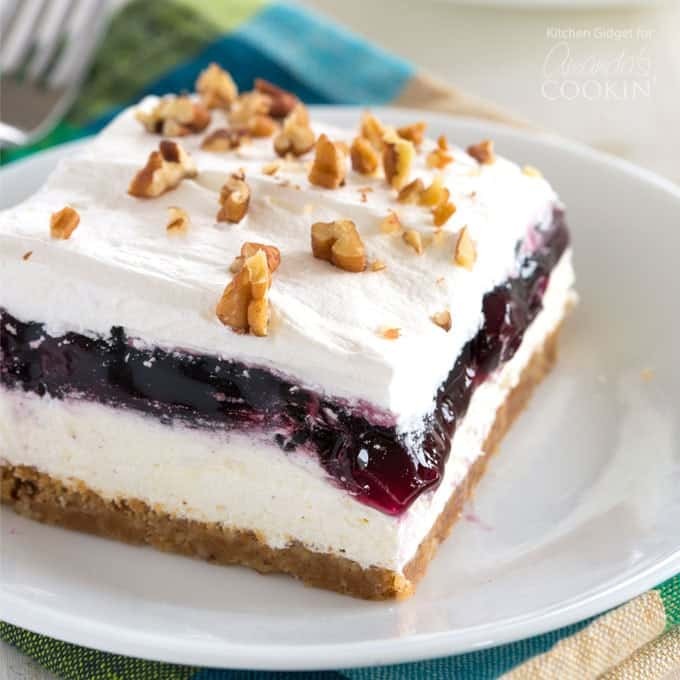 While we’re on the topic of beautiful lush desserts, be sure to check out Lemon Lush’s cousin recipe- Blueberry Lush! 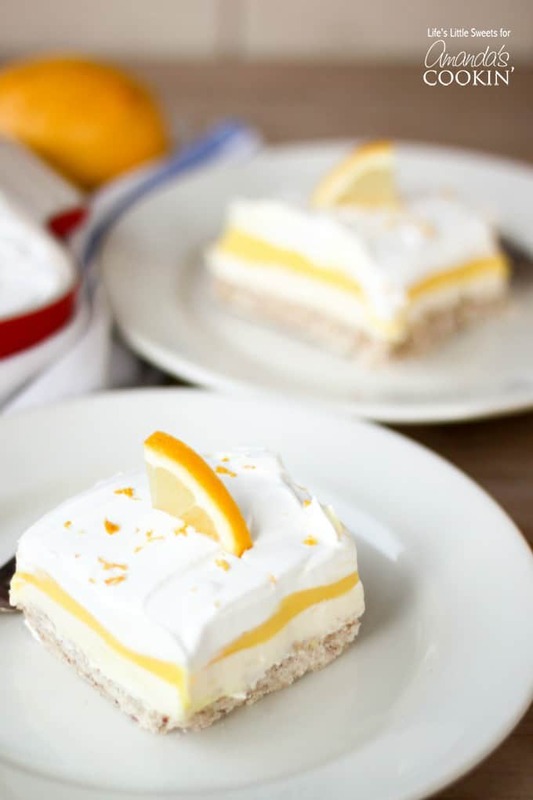 This Lemon Lush dessert recipe is perfect for Spring and Summer picnics and gatherings. 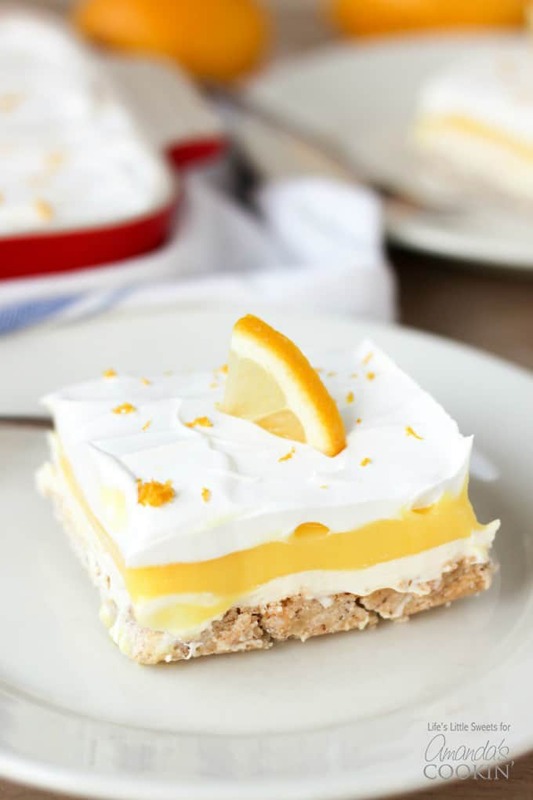 It’s so light and refreshing with 4 layers of bottom pecan crust, lemon cream cheese, lemon pudding and topped with a whipped topping garnished with lemon zest. In a large mixing bowl, combine flour, melted and cooled butter, finely ground pecans and 1/4 cup sugar. Press into the bottom of a 9 x 13 inch baking pan. Bake 20-25 minutes (25 mins works best for me) until golden brown. Allow to cool completely before adding any layers. 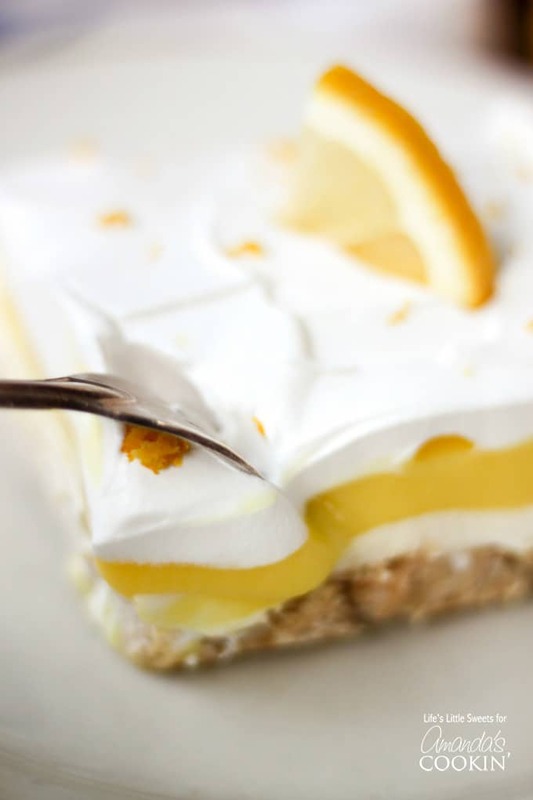 Using a hand electric mixer, combine cream cheese, 1 cup powdered sugar, 1-2 tablespoons fresh squeezed lemon juice (2 tablespoons works best for me). Mixture should be even and smooth. Spread evenly on top of the baked and cooled bottom pecan crust. In a large mixing bowl, whisk milk and instant lemon pudding mix until set. It may take 4-5 minutes to thicken. Spread evenly on top of the lemon cream cheese mixture. Spread thawed whipped topping on top of the pudding layer. Add lemon zest and optional finely chopped pecans. Refrigerate for 1 hour to set before serving. 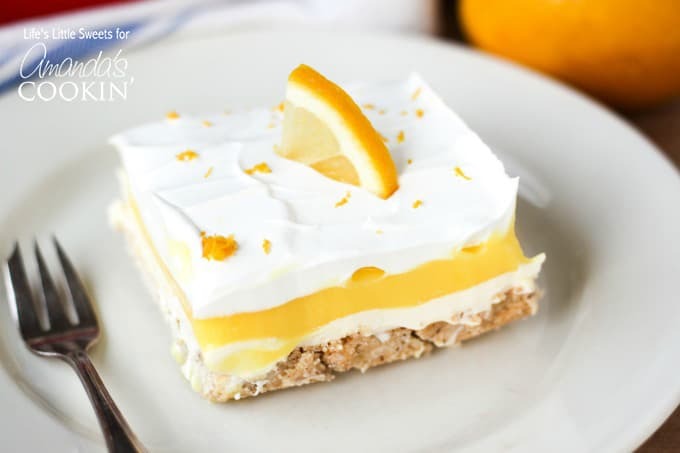 Optionally, you can freeze the Lemon Lush overnight for more defined slices. Do not freeze if you substitute homemade whipped cream because it might not hold up like frozen whipped topping like Cool Whip. Enjoy! I suggest using an offset spatula for spreading the layers and make sure it's clean before starting a new layer. After refrigerating, for serving to show more defined layers, you can just take a butter knife and "wipe" along the sides and the layers will show nicely. I suggest getting an organic lemon, if you can, since you will be using the zest to top the Lemon Lush.